Takato Matsuda is a human being from the Digimon Tamers canon. A cheerful and upbeat young teenager, Takato tries to get along with anyone that he first meets in an attempt to know them better in the hopes that they will become his friend. Most of his experiences in this have proven successful. He rarely gets angry unless something really upsets him to the point where he will be infuriated and his emotions take a negative aspect. He is a big fan of the Digimon Adventure/Digimon Adventure 02 series and looks up to Taichi Yagami. Now that Takato's grown up a bit, his personality remains largely unaffected, but he's trying to change himself ever since a conversation he had with his friend Ruki. He now hopes to be more independent and has taken a more active leadership role, especially when it comes to the safety of his friends; be they human or Digimon. Note: This page contains spoilers for Digimon Tamers. An only child of Takehiro and Mie Matsuda, Takato's parents ran a bakery in West Shinjuku and he only was able to help them out when he was able to. The day Takato Matsuda drew a Digimon that he named Guilmon, his life would never be the same again. That same night while he was sleeping, two things took place: his scanner changed into a D-Arc, scanned all his drawings of Guilmon and he had a dream. A dream about a Tamer named Ruki Makino and her Digimon partner Renamon. At the time, he'd thought it was only a dream but when he thought back on it, he realized that it could've been real. His suspicions were confirmed once he saw that his scanner had changed and his D-Arc now showed him a Digi-Egg. When his Digi-Egg hatched, Takato took it upon himself to track down his newly born Digimon partner and found himself below the city where Guilmon appeared. Guilmon was quite loyal to Takato, yet he wasn't entirely intelligent. (The fact that Guilmon repeatedly called him Takatomon instead of Takato didn't help matters.) Unfortunately, being a Tamer was going to be completely different than watching the Digimon show on TV and Takato was about to learn that firsthand. Guilmon rarely, if ever, listened to what Takato said. The first time that happened near the Shinjuku school he met Jenrya Lee and his partner Terriermon, who informed him that he would need to keep better track of his Digimon. Once finding Guilmon, Takato knew he would need to hide him better. Takato's second Tamer encounter would truly be a memorable one, as he literally met the girl of his dreams. Ruki Makino wasn't like Jenrya; she believed that all Digimon were nothing but data and lived to fight; the more they fought and won, the faster they would Evolve to the next level. Jenrya believed otherwise, that Digimon were real and that they didn't need to fight, which only lead to pain and death. Takato was…somewhere in the middle regarding both viewpoints. The three young Tamers had lots to learn from each other, especially when it came to Evolution. Out of the three viewpoints, Takato felt like he resonated more with Jenrya as he truly cared for Guilmon, which showed the day that his partner encountered Devidramon and resulted in Guilmon Evolving into Growmon. When Growmon didn't change back to his Child Form straight away, Takato was twice as concerned now as he'd been when his partner was Guilmon! 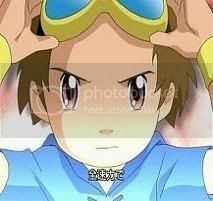 Hiding him proved to be unsuccessful on more than one occasion, but Takato did show that emotions really helped when it came to their Digimon partners. His tears helped Growmon to become Guilmon once again. Slowly but surely, the Tamers were beginning to come into their own with their partners but it wasn't until their very first encounter with the Devas that their team became unified. The day they encountered Mihiramon, Takato was the first to discover that their bond with their Digimon grew as their powers did; when Growmon felt pain, Takato felt it too. He also discovered that for their Digimon to be stronger, the Tamer needed to be stronger. Takato was the first to have their Digimon Evolve to the Perfect level of MegaloGrowmon. As their battles with the Devas continued, Takato's other friends Juri Katou, Hirokazu and Kenta began to be dragged into the Tamers' world and desired to have partners of their own. It was during the battle with Vikaralamon that Juri received her D-Arc and her partner, Leomon. It was after this battle that the Tamers ventured into the Digital World for the first time, in order to save Culumon. When Takato told his parents about Guilmon, they came to accept him as well as Takato's decision to go to the Digital World. Needless to say, their experiences in this Digital World was nothing like the television show! The Tamers found themselves separated from each other on more than one occasion; they ended up meeting Ryo Akiyama, reunited with Culumon and their lost comrades and during a confrontation with Beelzebumon, known to them as Impmon, Takato, Jenrya and Terriermon were separated from their friends! It was during this time that Takato found out that Guilmon had been brought to life with help from the DigiGnomes. Unfortunately it wasn't too much long after that, that when Takato was reunited with Growmon that the Tamers lost one of their own. With Leomon's death and absorption into Beelzebumon, Takato lost it. His anger caused Growmon to instantly become MegaloGrowmon, and the two of them engaged in battle. Despite the disadvantage MegaloGrowmon had-him being a Perfect level, and Beelzebumon being an Ultimate level-Takato forced his partner to Evolve, which brought the first-and so far, only-appearance of Megidramon. As a result of this, Takato's D-Arc burst into data and was destroyed. Takato hadn't meant to make his Digimon partner become…a destructive Digimon who's appearance nearly spelled the end of the Digital World! It was thanks to Takato reconnecting with his partner that Guilmon returned to normal and that, together, the two of them Matrix Evolved into Guilmon's true Ultimate form of Dukemon. Dukemon and Beelzebumon battled each other to a near-standstill, with Dukemon emerging victorious. Takato was about to deliver the killing blow, but Juri pleaded with him not to do it, that killing Beelzebumon wouldn't bring Leomon back. Dukemon agreed, and as Takato and Guilmon separated, he received his updated D-Arc. As the Tamers' adventures in the Digital World slowly came to a close, they encountered Zhuqaiomon a Sovereign Digimon who was responsible for the Devas in the first place, and Quinlingmon, who stopped an eventual battle between Dukemon and Zhuqaiomon; he explained that their true enemy, the D-Reaper, had finally made it's presence known. The Tamers would soon leave the Digital World, with a few extra passengers in their Digimon partners as well as Ryo, Cyberdramon and Impmon, who Ruki and Renamon went to find the day their families sent an Arc-like ship to retrieve them. Not wanting to leave Ruki behind, Takato stayed behind as the Arc started ascending. Takato ran in an attempt to get onboard and grabbed Jenrya's hand, but he and Culumon hit the ground hard and watched their friends leave…up until the ship suddenly stopped! It was at this time that Ruki and Kyubimon finally made it back with Impmon, so with help from Ruki Takato and Culumon hitched a ride and the four of them jumped on the ship as it made it's way back to the Real World. The Tamers' battle with the D-Reaper would show their true abilities in more ways than one; they had lost the ability to Matrix Evolve with their Digimon at first and could only fight with their partners in the Perfect level until Alice appeared with Dobermon. It was thanks to Dobermon's sacrifice of his own life that Takato, Ruki and Jenrya were able to Matrix Evolve once again. However it was that same day that Takato found out that Juri wasn't with her family. She had, in fact, been taken by the D-Reaper. It was only after battle after constant battle-one of which saw the reemergence of the Arc as a Digimon called Grani, who became allied with Dukemon specifically-that the Tamers were able to strike a final, decisive blow against the D-Reaper thanks to a program that Jenrya's father had made. Despite the boost in power, Takato found himself unable to succeed in rescuing Juri until Grani sacrificed himself and merged with Dukemon to Mode Change into Dukemon: Crimson Mode! It was thanks to the Tamers' combined teamwork and friendship that they were able to destroy the D-Reaper and rescue Juri. It was after this battle sadly, that the Tamers had to part ways with their Digimon, seemingly for good. Takato had promised Guilmon that they would meet again and after a while had passed, Takato doubted that he would be able to keep that promise. Once returning to Guilmon's old hideout, Takato soon found a Digiportal and realized that he could keep that promise after all. After a month had passed, Takato was reunited with Guilmon and was able to keep his promise with his partner. It was sometime during this month that Ruki's birthday was approaching and Takato, in on the plans that a party was going to be thrown for her, accidentally spilled the beans to her. He apologized and said he would make it up to her by taking her to see the cherry blossoms. That conversation was brought to a halt with the appearance of Locomon, and when Growmon was unsuccessful in stopping the Digimon from speeding down the tracks, Takato got onboard in the hopes that he could somehow stop the Perfect level Digimon. Sometime later, Ruki and Renamon, having the same idea, boarded the train and ran into Takato; despite their plan on stopping it, the true threat was Parasimon, who possessed Ruki much like it had possessed Locomon and forced her to attack Takato. It was thanks to Guilmon's timely appearance onboard the train that Ruki was saved-twice. Once by Guilmon, and again by Takato when she nearly fell off the train. Takato saved Ruki once again by Matrix Evolving with Guilmon into Dukemon to save her and destroy Parasimon. Takato proved how much he had changed by Mode Changing into Dukemon Crimson Mode to save the city from an invasion of Parasimon. …And were separated from each other mid-trip and landed in an entirely different Digital World! Takato and Guilmon crash-landed on top of Sokka and his partner Garurumon in Junk City, and met with Taichi Yagami and his partner Agumon at the same time! Unfortunately, Takato's D-Arc went through it's third transformation, becoming a D-Communicator, or D-Comm for short. Takato was slightly amazed by it, but also disappointed; now his new cards that he'd managed to purchase, as well as his old ones, weren't of any use to him outside of the Digimon card game. Along his travels, Takato soon found out that days after he and Ruki had appeared, Shuichon Lee-Jenrya's sister-had arrived in the Digital World too. Takato figured that safety was better in numbers so he planned to round up his team of Tamers, no matter how limited they were! Takato, Guilmon, Ruki and Renamon were reunited in D'Ango Forest and started toward the Dokkako Jungle, where they-truthfully, it was Takato-had promised they would pick up Shuichon and Lopmon. Unfortunately, it was around this time that, on the day Takato had decided to climb a tree to try and track down Shuichon better and not heed Ruki's advice that he shouldn't climb it, he fell and slipped into a coma! Being stuck in the coma for over a month, he missed out on the action that occurred when Shego and Azula had decided to take over the Digital World. When he finally came to at the Pyoi mountains near the forest, Takato found out that Ruki had vanished entirely from the Digital World and was reunited with Ryo Akiyama! True, he had met a Pokemon trainer-turned-Tamer Molly Hale, but it did nothing to ease the pain and guilt in his heart. The three of them, along with Daisuke Motomiya and his partner Veemon, currently Chibimon, made their way across the D'Ango Forest again with Takato occasionally talking with others on his journal until he found out that his friend Jenrya had been brought to this world too! His hopes restored to a point, Takato recalled Ruki's advice that she'd given him prior to her disappearance about being more independent and renewed his vow that he would reunite his friends. Not too long after, Takato's pain was lifted upon hearing that Ruki was back in the Digital World! He immediately changed course a little bit, deciding that he and the others-now known as Team Gogglehead/Goggleface-would find Ruki first, then Jenrya, and then Shuichon before going to Tetha and finding Molly's friend Mikey Rogers. Once hearing that someone who Takato considered a good friend-Yoshino Fujieda, who had talked with Takato for a while via their journals and who he confided in that he was starting to develop feelings for Ruki, but didn't state outright who it was; her advice to him was to be himself and to not rush into anything-had gotten poisoned, Takato knew that he couldn't just stand by and watch anyone else get hurt! The next morning, Takato had gotten his team up at the crack of dawn following breakfast and made his way through the forest…where he was the first out of their team to reunite with Ruki. Takato almost immediately apologized for what had happened but Ruki told him that it was in the past and that they needed to find Jenrya and Shuichon. Takato soon talked with a new Tamer on his journal named Aelita and bonded with her quite well. At learning that she was in Dokkako Jungle, Takato suggested that she meet up with Shuichon since he didn't want her to be alone in an unexplored Digital World and that after they found Jenrya, they would all meet halfway. Miraculously, the Tamers were all able to reunite with each other and successfully arrive in Tetha. Once there, Takato had come across a bakery and was informed that as long as he could keep it running, they wouldn't have to worry about payment. Takato isn't the only one who runs this bakery; Aelita, Mimi, Molly, Shuichon and Olette help him in keeping the Matsuda bakery up and running. Their Digimon stand outside promoting the store as best they can. Takato eventually found out that Ruki did return his feelings for her; sadly enough, due to their recently established bond, Takato unknowingly developed feelings for Aelita, who also reciprocated similar feelings despite having to deal with a triangle of her own back in her world. After having given it some serious thought, and having half a month to realize the seriousness of his situation, Takato decided he would pursue a relationship with Ruki. This decision didn't come without consequences, and both he and Aelita were devastated by the outcome but have decided to remain friends. When it became knowledge among the Tamers that Jenrya and Terriermon had left Tetha-and seemingly the Digital World-Takato offered to be Shuichon's brother until Jenrya came back but added that he wouldn't get too worried about her; Shuichon said she wouldn't mind if he did so every now and then. Eventually, Jenrya did return to the Digital World and despite the fact that her older brother had returned, Shuichon still refers to Takato as her nii-san. Relationship-wise, Takato and Ruki seemed to be doing quite fine. However, Takato is still prone to momentary fits of jealousy in regards to Ruki and Ryo; Ruki herself has been jealous concerning Takato's involvement with Aelita but rarely speaks about it. This caused a schism to develop between the two during the time the Tamers were all afflicted with a Disney Virus; Takato had caught Ruki and Koushirou singing "The Tango Ryo" as well as performing the tango. (One of Takato's hopes is that one day Ruki will want to dance with him even if she isn't wearing a dress.) The two of them engaged in an argument and Ruki broke off their relationship. After realizing that he couldn't live without Ruki in his life, Takato decided to permanently end any chance of a relationship with Aelita. This decision was doubly heartbreaking for the both of them, as the kiss only proved to Takato and Aelita that they could've shared something very special together if they weren't involved with their best friends. Not long after that, Takato tracked Ruki down and admitted to her that she told him certain words regarding her feelings for him and he repeated those words, but in his own way. Ruki responded the only way she could think of-by nuzzling her head against his neck and hugging him before saying that she would return with him to the bakery. Since that special moment, Takato has vowed that he would do whatever it took to maintain his relationship with Ruki and that they wouldn't break up again. Things between Takato and Ruki were also thrown out of whack when they discovered that a Tamer by the name of Tatsuo Matsuda appeared in the Digital World shortly before things imploded between the two Tamers. Tatsuo, with his Digimon partner DORUmon, claimed that he was their son! An issue such as this is subjective to opinion between Takato and Ruki. Takato is more than willing to accept that Tatsuo could be his kid, even if he's from an alternate timeline; Ruki has continuously denied that Tatsuo is their child-to Tatsuo's face, as well as in many conversations with Takato and with her mother. Originally, Takato had feelings for Juri ever since the series began, but it was only until the aftermath of the Parasimon invasion and their current trek through the Digital World that Takato has started to develop feelings for Ruki. He didn't know if they were truly genuine but discovered-thanks in part to a virus-that not only were his feelings genuine, so were the feelings Ruki had developed for him.